Europe are pleased to announce the release of a new studio album “Walk The Earth” on the 20th October 2017. If Europe’s 2015 album “War Of Kings” was the album that made the rock world realise what a formidable act Europe had become then “Walk The Earth” is the album that is set to establish the band as one of the most exciting contemporary rock acts of current times. “We were in the studio a few days into recording and Dave (Cobb, our producer) comes in wearing this very cool T-Shirt with one of Mike's designs on it. Immediately we knew we had to check Mike's other work and have him come up with an exclusive design for us based on the vibe of the album. We are very proud to have his amazing artwork as the Walk The Earth album cover! '- Joey Tempest on the appointment of Mike Sportes to do the cover. 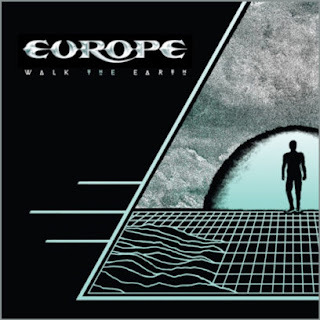 From the stunning opening salvo of the first single “Walk The Earth” – with pounding riffs and the aching vocals of Joey Tempest – to the brutal heavy riffing of “Haze”, from the instant melody of “Election Day” to the lyrical content of “Kingdom United”, “Walk The Earth” is the album that should see Europe rightly acclaimed as a band at the height of their powers. The wonderful melodies and depth of Joey Tempest’s vocals along with a powerhouse rhythm section and the guitar playing of John Norum, one of the great underrated guitarists. Norum’s guitar playing shines across the record. This is an album that is big in its scope and sound. Much like previous album “War Of Kings”, “Walk The Earth” is an album that needs to be lived with, in order to uncover it’s depth. The album was recorded at famed Abbey Road Studios in London with Grammy winning producer Dave Cobb (Rival Sons, Chris Cornell, Shooter Jennings, Jason Isbel, Chris Stapleton). Preceding the landmark event, fans were also treated to a live performance of Europe’s last album, 2015’s War of Kings, a release which re-established Europe as one of the top rock bands in the world. Since forming in 1979 Europe have sold over 25 million albums, toured across the world and become one of the greats of modern rock music. The bands all conquering “The Final Countdown” album has alone sold over 15 million copies worldwide and the single of the same name was No 1 in 25 countries.